Sub-shrub with blue-grey, glaucous divided leaves and large, crinkled white flowers with golden stamens which are produced over many months in summer. Vigorous once established and often suckers. 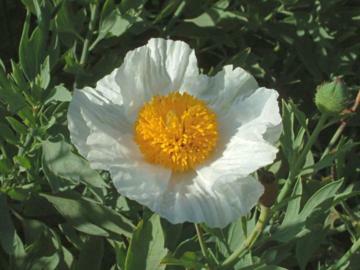 Thrives in dry and very well drained soils in full sun. Difficult to establish and may me slow at first. Also resents being moved. 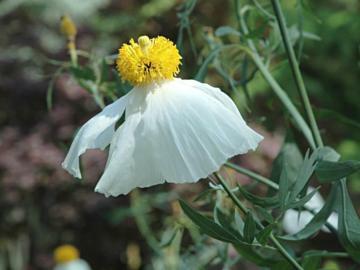 However once settled in its position it may become very vigorous, even invasive. From seed or by root cuttings, which may be easiest. Also by division of rooted runners, but needs care.